It's not about a cause -- it's about a woman. Okay? G.I. 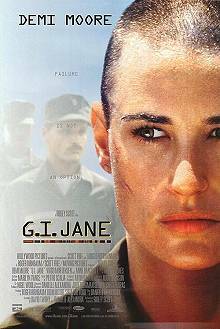 Jane has Demi Moore as the athletic, ambitious, naval intelligence officer who gets her chance at active duty. Jordan (Demi Moore) has survived dive school, jump school and four brothers. What she hasn't survived is active duty, and she needs active duty to get those vital promotions. When a wily senator (the excellent Anne Bancroft) blasts the military for its disciminatory practices, they offer the senator a put-up-or-shut-up project. Females who she selects will be put into previously restricted courses. Jordan is one of the candidates, smart, athletic, and she'd look great on the cover of Newsweek. So Jordan gets to go to Seal School -- the toughest course in the Navy. She takes it despite her lover's objections, only to find a 'girlie' version of the course set up for her. Don't cut your beautiful hair, girl, have separate quarters (a storeroom), and after the first gruelling test day, have some 'girlie' handicap points. Jordan is not there to make a statement, she asks, nay, demands equal treatment, no better, no less, and equal demands upon her ability. She shaves her head and moves her stuff into the bunk room with the rest of the trainees. If you can't stand a bloody fight, this is not the film for you. Jordan gets strained this, and pulled that, and foot rot and bloody noses, and this has to happen. No matter how brutal you may find aspects of this film, if you've never had an all-out assault on your person, then your first reaction is fear and shock -- you have to get to the place where your reaction is anger, outrage, and defiance. It is inevitable that Jordan survives to win the respect and acceptance of her instructors and her team. But how she gets there, and the obstacles (fair and foul) placed in her path make the trip interesting. For me, the hardest part of watching this film wasn't the discrimination, or the blood, but the memories of how much I enjoyed karate training on cold, wet beaches, and how I wanted to have a body that would withstand the kind of punishing exercise that we see Demi go through. Yes, Demi, we see her doing one-arm pushups and tough-tougher-toughest sit ups and know that that body is earned..
Definitely worth a look if you can stand watching a bloody fight.